To create biopinio Personas, the biopinio testers were first grouped according to eating behavior, then subsequently randomly positioned by a k-means algorithm simulation repeated 20 times. As criterion for the optimal number of clusters, the proportion of variance within the data has been defined and can be explained by the formation of clusters, while limiting the average group size per cluster. 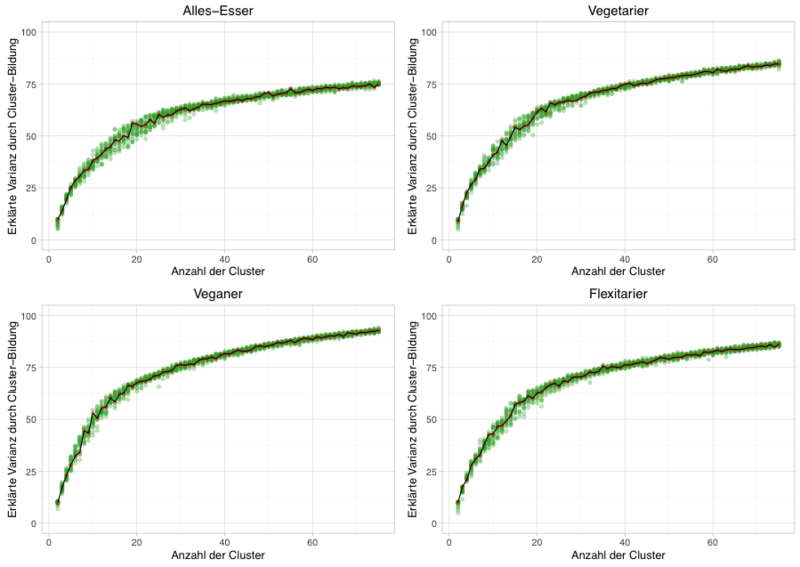 It proved for the data to be optimal to choose a limit of 60% – which is the case, for example, in 25 clusters of Everything-eaters. This threshold follows a marked decrease in the explanatory power and as well as maintaining sufficient group sizes. Segmentation based on the determined number of clusters was made in connection with the involvement of socio-demographic variables. In order to maintain the representation of the formed clusters, only those which contained at least 5% of observations per subgroup of eating behavior(for example, at least 108 Everything-eaters) were observed. The following cluster membership has been transferred to the original data considered as the occurrence of socio-demographic characteristics within these groups. A representative selection of Personas is then taken in consideration of clarity of individual characteristic features, while still preferring clusters as independent as possible. Portraits based upon the dominant characteristics were created for the personas built in this process. Personas allow for a refined approach to general tendencies of eater behavior. Generally speaking, everything-eaters and vegans come from more rural areas and Metropolises while vegetarians and flexitarians mostly come out of only cities. The selected personas confirm the trend of lower incidences of graduates among everything-eaters, and how daily consumption of organic products with flexitarians and vegans is wide spread. The observed incomes are often average, but decline for flexitarians and vegans. In regards to breakfast behavior, Everything-eaters and Flexitarians were the main coffee consumers. The use of cereals is generally low, however, especially in vegans and vegetarians. Flexitarians eat on average the longest, but the time varies considerably within the four groups of eating behavior. Vegan and Everything-eaters both eat in a different environment during the weekend. Loss of appetite is a partial problem only for Christa the Flexitarian. Please contact us for more information and an individual consultation!